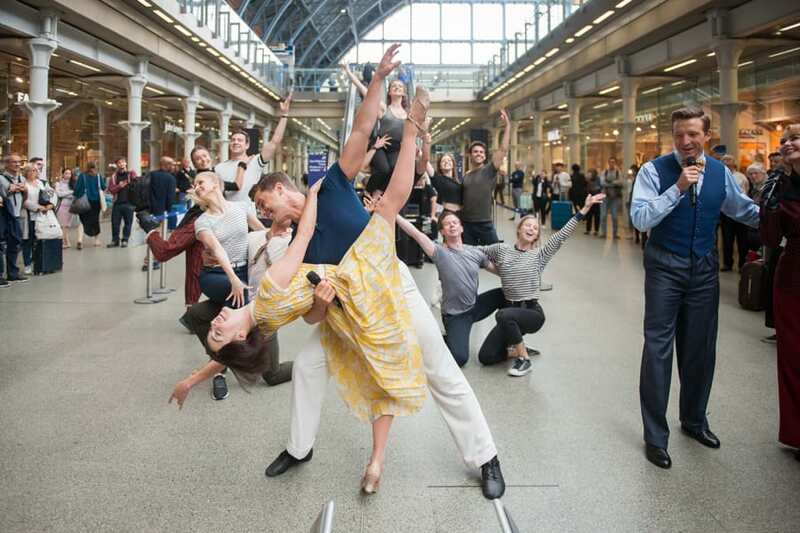 Visitors to St Pancras International were left with a spring in their step yesterday, as the London cast of hit musical An American In Paris celebrated their 200th West End performance brought song and dance to the station with a surprise performance. Passers-by were delighted when lead cast members Ashley Day (Jerry Mulligan), Leanne Cope (Lise Dassin) and Haydn Oakley (Henri Baurel), along with David Seadon-Young (Adam Hochburg) and Zoe Rainey (Milo Davenport), dressed in full costume and tickled the ivories of the famous St Pancras International pianos with a live recital of the show’s gorgeous Gershwin soundtrack. The latest addition to St Pancras International’s calendar of new and exciting arts and music experiences, the An American In Paris cast dazzled onlookers with classic hits including ‘S Wonderful and I Got Rhythm, to celebrate their 200th performance in London. Two lucky members of the gathered audience were even rewarded with free tickets to see the show in full at London’s Dominion Theatre. An American In Paris is the breathtakingly beautiful new Broadway musical which triumphantly transferred to the Dominion Theatre in March of this year, earning rave critical reviews. Following a chance encounter with a beautiful young dancer, a young American GI fulfills his dreams in the ‘City of Light’, the post-war backdrop to a sensuous, modern romance of art, friendship and love. The musical recently announced its extension at the Dominion Theatre until 28 April 2018.